Photography themes are designed to showcase their unique design while largely letting photographs do the talking. These themes are usually based on interactive elements and multimedia files to reflect a person’s artistic mind and letting them display their best work in a beautiful and fashionable manner. These WordPress themes are a combination of stunning dimensions and layouts with varied image formats, making each theme stand out from the rest. Here are some of the most beautifully created WordPress themes to justify the love of photography. King Size is a creative, modern and highly customizable WordPress theme ideal for a freelancer, professional and hobby photographers, art portfolio, photography and other photography-centric sites. The theme comes with an upright menu on the left and a full-screen slideshow background to improve your website interface. 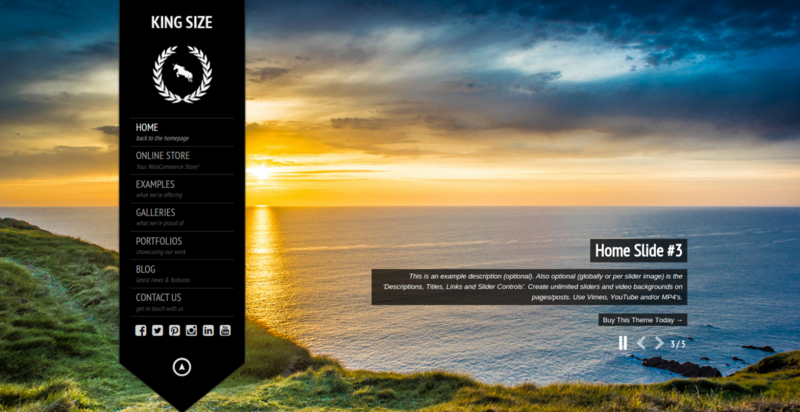 Showcase your best work in four different types of portfolios. A wide variety of photo galleries integrated into the theme allows you to create unlimited photo galleries. Offers 6 different galleries including SlideViewer, PrettyPhoto, Orbit, Galleria, FancyBox, and Colorbox. 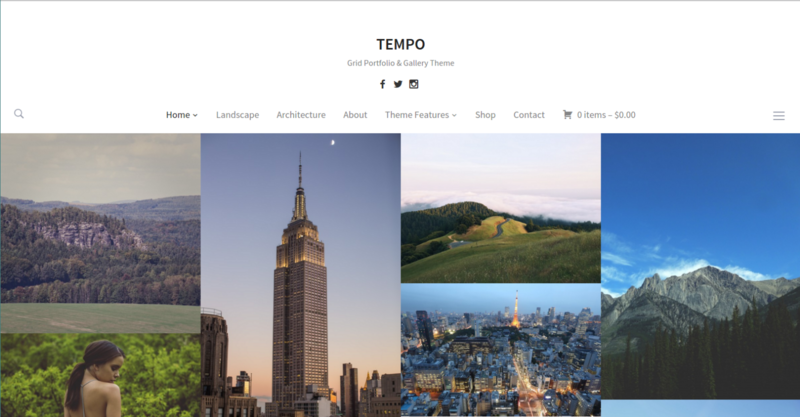 Tempo is a minimal yet stylish WordPress theme that offers two different layouts to choose from – a masonry or a grid layout. Tempo has a fully responsive design layout, making your galleries and images look perfect regardless of the screen size and device. Use inbuilt Live Customizer to give your website a desired look and appearance or simply choose from the two different inbuilt color schemes i.e. Light or Dark. Tempo WordPress theme also lets you highlight your header with 3 different header layouts – logo on the left, logo on the right and centered. 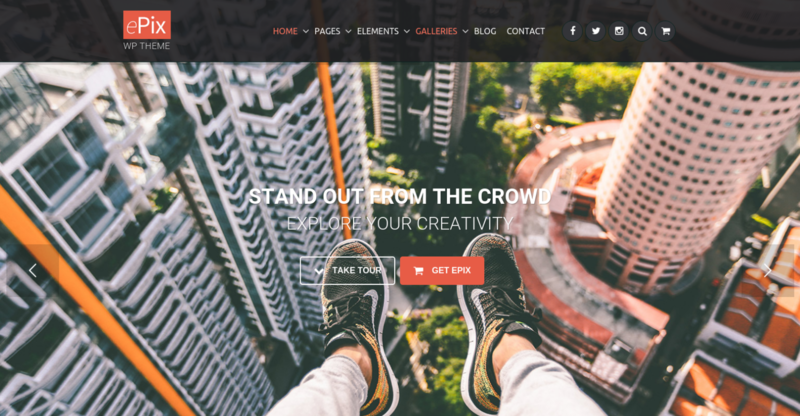 Exposure is a highly creative, conceptually innovative and graphically stunning WordPress theme well-suited for photographers, and other creative fields. Exposure’s design frames the images without overpowering their effect. 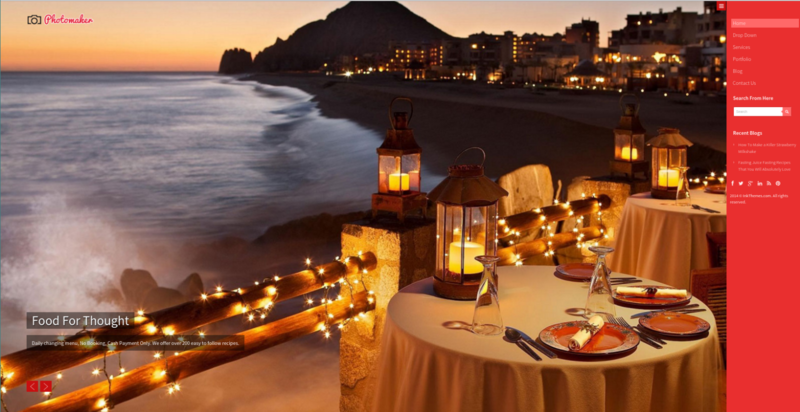 Elegant typography and plain pastel colors are used to frame additional photographs. The theme lets you showcase your best work in carousel or masonry layout. Designed to showcase your artistic side, PhotoMaker is a beautiful, versatile, and truly impressive WordPress theme that boasts of its clean interface and responsive design layout. The theme comes with Custom Menu Module that allows you to manage the menu of your website flexible and fuss-free. Photomaker is equipped with a services page which gives you the freedom to display your services in a better way. 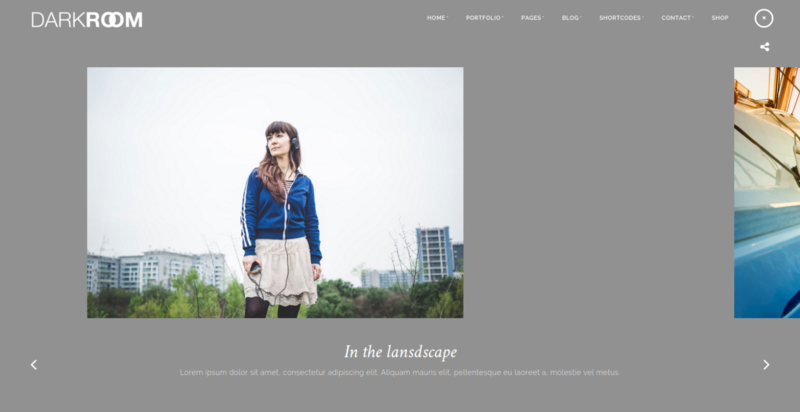 From unique blog features to amazing portfolio options, the theme has everything that a photography may be looking for on his/her website. Darkroom is a fully responsive, retina ready and WooCommerce ready WordPress theme ideal for graphic designers, illustrators, photographs and other creative photography focused sites. The theme allows you to choose from two different header skins i.e. Light or Dark. The theme also allows users to toggle full-screen mode to help them display background images and slideshows. 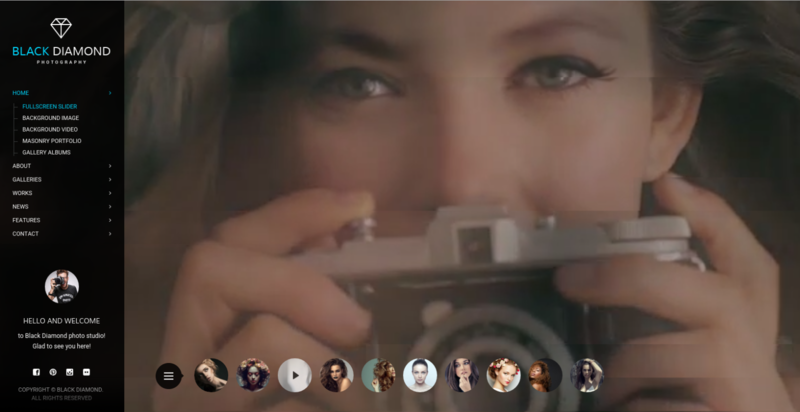 Darkroom offers 8 full-screen styles including Fullscreen HTML5 Video, Fullscreen Slideshow, Fullscreen Carousel, Kenburns Slideshow, Photowall Fullscreen, vimeo Fullscreen videos, Youtube HD Fullscreen Videos and Single Image Cover. Diamond is an easy to use, powerful, aesthetically appealing, and stylish WordPress responsive theme, designed keeping in mind visually heavy sites that need to display a plethora of high-resolution photography and images to a wider market. Diamond comes optimized for speed and user-friendly interface. The latest version comes equipped with fullscreen slider to support videos and photos and make your photography much eye-catching. ePix WordPress theme is a great example of streamlined implementation and quality design. The theme has managed to get a 5-star rating and has been bought more than 3,479 times. ePix WordPress theme comes integrated with unlimited color skins to help you choose the one that reflects your artistic nature and style. The array of advanced features is staggering, giving you the freedom to tweak the design of the theme as per your needs and requirements. 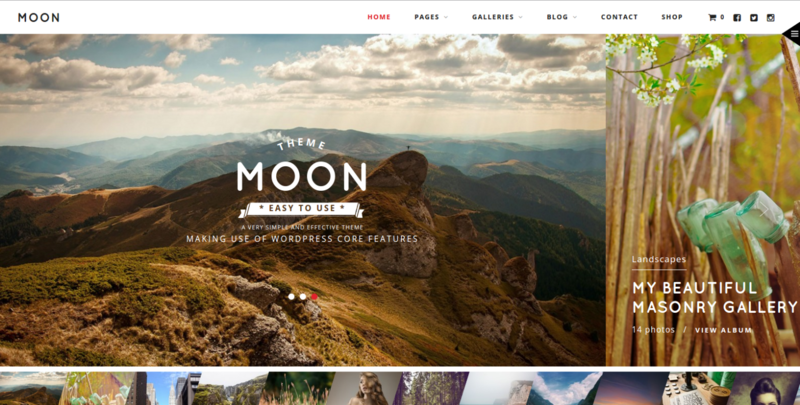 Moon is an impressive WordPress theme that is designed to help the emerging need of photographers around the world. The theme helps users to display their images, files and videos in a manner that capture the visitors eye. Moon can also help you improve your website’s visibility and search engine rankings, thanks to its SEO-friendly structure. Creating beautiful, aesthetically appealing yet powerful photography websites with Photocrati WordPress theme, an epic WordPress theme. The theme itself does not have any particular design but offers 60 different unique ready-to-use templates to use. The theme has fully responsive design layout to make your website look presentable on different devices and screen sizes. Photocrati is also equipped with inbuilt gallery management. 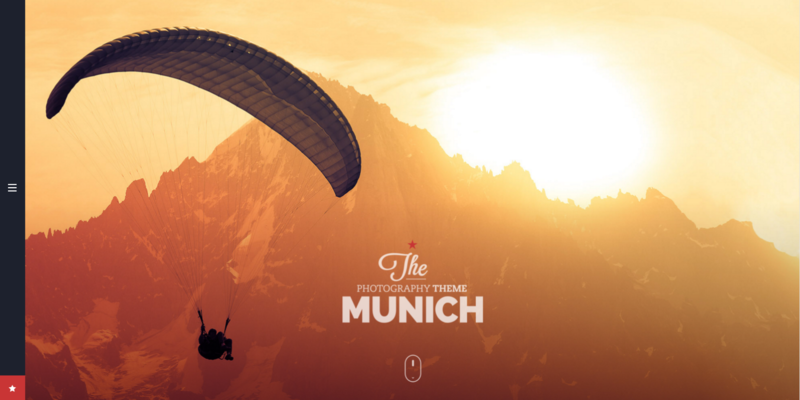 Munich is a carefully designed WordPress theme that comes with many advanced features to make your photography site stand out in the crowd. The theme also offers retina ready framework, responsive design layout and easy to use structure. The theme is extremely easy to set up and update since it comes with one-click updates. Emma is a renowned WordPress developer by profession and writer by hobby. She is working for Wordsuccor Ltd. If you’re looking for WordPress Theme Customization Services , then you can get in touch with her. Emma already has multiple WordPress-related articles under her name.